Interrogated by SMERSCH / Topf engineers, Kurt Prufer, etc. -Fritz Sander, principal engineer of the company and head of the department for construction of crematorium. -Kurt Prüfer, chief engineer for the construction of crematoriums and heating. -Karl Schultze, chief engineer for ventilation equipment and design of ventilation for crematoriums. -Gustav Braun, civil engineer and production head of the company. 70 year old Fritz Sander died early on after three interrogations of exhaustion. Prüfer died in 1952 at the age of 61 in a gulag. The other two were released in 1955 and came home. Engineer Prüfer before the interrogations. This is how the man looked like after the interrogations by SMERSCH, a Soviet anti-espionage organization. The accused confessed to everything which their interrogators wanted out of them, in a monotonic and robot like fashion, their confessions changing over the years in synchronism with the evolving Auschwitz story into what it is today. After the collapse of the communist system in Russia attempts were made to have the engineers rehabilitated. This was refused on June 30. 1992 by the Russian public prosecution, because Prüfer, Schultze and Braun confessed, because of statements by other accused, because of correspondence with the SS and because of the confession of Höß. Zweifellos hat der russische Staatsanwalt in guten Treuen entschieden. Wie hätte er auch auf den Gedanken verfallen können, die wegen angeblicher Mittäterschaft bei einem industriellen Massenmord verurteilten Ingenieure zu rehabilitieren, wo doch die „deutsche“ Regierung mit fanatischer Verbissenheit auf der historischen Realität dieses industriellen Massenmordes beharrt und sämtliche wissenschaftlichen Erkenntnisse, die in gegenteiliger Richtung weisen, mit polizeistaatlichem Terror unterdrückt? Weswegen sollte er die Aussagen des ehemaligen Auschwitz-Kommandanten Rudolf Höß nicht als »maßgeblich für diese Strafsache« einstufen, wenn das monströse, durch Folter erzwungene Höß-Geständnis deutschen Schulkindern bis zum heutigen Tage als Beweis Nummer eins für den „Holocaust vorgestellt wird? Warum sollte er nicht »anerkennen, daß Prüfer Kurt, Schultze Karl und Braun Gustav in der einschlägigen Strafsache zu Recht verurteilt wurden«, wenn das Andenken an diese Männer 45 Jahre nach ihrer unrechtmäßigen Verurteilung von einem drittklassigen Propagandisten namens Gerald Fleming sowie von Spiegel-Schmierfinken straflos in den Schmutz gezogen werden darf? Wenn das Lügen dereinst nicht mehr staatlich befohlene Pflicht ist, wird auch das Dossier der Topf-Ingenieure neu aufgerollt werden müssen. Die einzig mögliche Folge wird die Wiederherstellung ihres guten Rufes sein. No doubt did the Russian prosecutor decide to the best of his knowledge. And how could he have possibly have thought to rehabilitate the engineers, who were sentenced because of alleged complicity with an industrial mass murder, when the “German” government still today insists with fanatical obstinacy on the historical reality of this industrial mass murder, and suppresses all scientific cognitions, which point in the opposite direction, with state-police terror? Why should the Russian judge not take into account the confessions of Rudolf Höß, the former Auschwitz commandant, as »important for this criminal case«, when the monstrous Höß confession, which was forced through torture, is introduced up to this day as proof number one to German school children? Why should he not »acknowledge, that Kurt Prüfer, Karl Schultze and Gustav Braun in the relevant criminal case were sentenced justly« when the memory of these men 45 years after their unjust conviction by a third class propagandist with the name of Gerald Fleming as well as a Spiegel-Schmierfink (slanderer. Graf refers to an article by Der Spiegel of Oct.4 1993 which stated [...] that the confessions were forced through pressure is unlikely) can be dragged with impunity through dirt? When one day lying is not anymore a duty ordered by the German state, the dossier of the Topf-engineers will have to be reopened. The only possible consequence will be the restoration of their good names. I haven't see all of the alleged text of these men's alleged "confessions", but if they're anything like Hoess's they're obviously absurd, scientifically impossible, and frankly laughable. Note: Text in italics are from the protocols, the rest are comments made by Graf. Since the text is rather long I will split it into several parts with some time in between for discussions or opinions. Engineer Kurt Prüfer, who carried a large direct responsibility in the erection of the crematoriums of Auschwitz, was first interrogated on March 5, 1946. The interrogation was conducted by Captain Schatanowski and Major Moruschenko. We will reproduce the full text of this interrogation. »Question: Since which year were you member of the National Socialistic party? Answer: I became member of the National Socialistic party already soon after Hitler came to power in May, 1933. Question: Since when and in what position were you employed by the firm Topf? Answer: I worked since 1920 for the firm Topf in the branch in Erfurt. Until 1923 I was a technician; from 1923 until recently I was employed as leading engineer for the construction of crematoriums and heating. Question: How many crematoriums were erected by the firm Topf during the years? Answer: From 1912 to 1933 they built 110 crematoriums or cremation ovens. From 1933 to 1945 were up to 50 cremation ovens erected. From 1942 to 1945 were up to 25 cremation ovens built. Question: Since which year, where and what number of crematoriums for concentration camps were in Germany erected? In Buchenwald: One crematorium with two ovens in the year 1941. In Dachau: One crematorium with one oven in the year 1940. In Mauthausen: One crematorium with one oven in the year 1943. In Auschwitz: Four crematoriums with twelve ovens in the years 1943 and 1944. Question: How do the crematoriums for the concentration camps differ from the ones for civilian use? Answer: The crematoriums for civilians had only one introduction opening (muffle) for the cremation of the corpse, in rare cases two. The crematoriums for the concentration camps had three introduction openings. The size of the introduction opening is smaller in the crematoriums for concentration camps – 70 x 70 cm -, the length two meters, against two meters thirty for civilian crematoriums. Instead of a wheeled carriage on tracks, which is used to drive the corpse in a coffin into the introduction openings, is the corpse in the crematoriums of concentration camps slid on a hand carried stretcher without a coffin into the oven. In civilian crematoriums preheated air is blown into the muffle, which will result in a quick and smokeless cremation. The design of the crematoriums for the concentration camps is different; it does not make it possible to preheat the air, and therefore the corpse will burn slower and under smoke development. In order to reduce the smoke as well as the smell of the burning corpse a forced air system is provided. Question: What number of corpses could be cremated per hour in a crematorium in Auschwitz? Interestingly this answer – which complied with the fact – was accepted by both interrogators without a comment, although it openly contradicted the alleged fantastic capacity of the crematoriums by the various eyewitnesses as well as the Soviet expert report from the year earlier. According to those expertises the crematoriums II and III could cremate within 24 hours 5000 and the crematoriums IV and V 3000 corpses within the same time. The cremation installations of Auschwitz-Birkenau had to have necessarily such fantastic capacity if in them – as alleged by the Soviets – the larger part of the alleged four million Auschwitz-victims could be changed to ashes. »Question: Since when did you personally receive the order to build crematoriums for concentration camps? Answer: In the year 1940 the president of the company Ludwig Topf called me in and suggested, to build crematoriums in which each oven should contain three introduction openings (muffels). He indicated to me, that the order came from the SS. I started with the design of a cremation oven right away. It should be indicated, that I together with Ludwig Topf designed such ovens with three muffles already in 1939 and did submit my plans to the war ministry of Germany. The SS accepted the crematorium with my oven design in 1940. A few weeks later I learned, that these ovens which were designed by me were accepted by the SS-Führung for the construction of crematoriums for concentration camps. Question: How many times and for what purpose did you travel to the concentration camp Auschwitz? Actually Prüfer was in Auschwitz more often than those five times. From the documents of the Central Construction Office it can be gathered, that he was in that camp on October 21 and 22 1941 as well as on August 19 1942. »Question: Were you together with Schultze on a business trip in the concentration camp Auschwitz? Answer: Yes, I was on the business trip in the concentration camp Auschwitz in the spring of 1943 together with Schultze. Question: What did you together with Schultze observe in the camp Auschwitz? Answer: I personal saw, how a SS-woman drove female inmates into the barracks with dogs. I also saw Jews, who under guard of the SS dug earth with bare hands and carried it from one place to another. When I was in the crematorium I saw myself, at about 10 o’clock in the morning, that there were on the floor up to 60 corpses of men and women of different ages, who were prepared for the cremation in the crematorium. Six bodies were burned in my presence, and I concluded, that the ovens functioned well. Question: Did you see next to the crematoriums a gas chamber? According to the description of Prüfer the gas chamber was located outside of the crematorium, exactly as the Smersch-officer had suggested with his question (»next to the crematoriums«). Therefore it could not have been about the gas chambers which were allegedly installed in the crematoriums. According to Prüfer there was a »connection« between the gas chamber and the crematorium as well as between the gas chamber and a wooden barrack. Did Prüfer therefore talk about one of the two “bunkers”, in which actually according to the official history version in the spring of 1943 was not gassed? The farm houses were supposedly located at a distance of 550 or respectively 900 m (air distance) away from the crematoriums II and III! What sort of »connection« could have been involved? Prüfer does not furnish any indication for this and the chief interrogator omitted to question back. »Question: Did you know, that in the gas chambers and crematoriums the destruction of completely innocent people was undertaken? Answer: Since spring 1943 I knew, that in the concentration camp Auschwitz completely innocent people were destroyed and their corpses burned in the crematoriums. Question: What did Karl Schultze tell you about the corpses, which you saw lying around in the crematorium? Answer: Schultze told me in the spring of 1943 in the morning in the crematorium about the corpses of up to 60 men, women and children lying around, that they were murdered in gas chambers. Question: Which part of the gas chambers was designed by the Topf Company? This statement corresponds to the myth which later became the official historical writing, that in German war time documents the words »mortuary hall« and »mortuary basement« were only euphemism for “gas chamber”. --- he gives cremation times which are in complete disagreement with the standard impossible tales of mere minutes, Prufer says 1 hour per corpse. When worked out mathematically, 1 hr. per corpse demolishes the numbers alleged within the timeframe alleged. That 1 hr. time length is in conformity with actual facts about cremations. Highly quoted alleged "eyewitness" Henryk Tauber stated that a body could be cremated in 7-9 minutes! 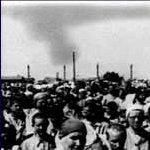 And Auschwitz "eyewitness" Dov Paisikovic, stated that the cremation of one body took about four minutes! But "eyewitness" Tauber said that he inserted & cremated EIGHT bodies at once....in order to signal Allied aircraft with smoke!! !...But Pruefer stated in another interrogation that more than one body per muffle would damage the oven. Apparently Pruefer's method worked well, aerial photos of the period show no smoke from the crematoriums. However, "eyewitnesses" claim that the smoke 'blackened the sky', there are absurd drawings of hellish scences where fire & smoke belched from the chimneys (i.e. "eyewitness" Olere's drawings). --- His descriptions of the alleged gas chambers are completely at odds with the standard story, not even close...so absurd that it is obvious that he is improvising here to placate his interrogator....sounding more & more like the bizarre Hoess "confesions"
The 'SS woman with dogs' and the 'Jews digging with their hands' is irrelevant, but sounds like repetition of dumb propaganda...a required 'political correctness' statement from Pruefer as he faced his potential hangman. In summary, Pruefer got a few facts in which contradict the standard story, but otherwise is simply making up things when he tries to discuss the gas chambers and other matters. He knew about cremations, he knew nothing (and for good reason) of gassings so he took a shot at improvised appeasement. The more you investigate the so called 'holocau$t', the more ridiculous it becomes. (Note: Text in italics are from the protocols, the rest are comments from Graf. Since the text is rather long I will split it into parts with some time in between for discussions or opinions. »Question: Who was the design engineer of the ventilation system in the gas chambers? Answer: The design engineer of the ventilation system in the gas chamber was Schultze; he installed it. Question: Explain truthfully why in the chimneys of the crematoriums of the Auschwitz camp the inner refractory clay cladding so frequently crumbled! Answer: The inner refractory clay plastering of the crematorium chimneys in Auschwitz began already after half a year to crumble as a result of the huge loading, which these crematoriums were subjected to in the concentration camp. Question: Therefore you have, although you knew already in the spring of 1943 that the crematorium ovens designed by you served for the destruction of completely innocent people, nevertheless continued to work in this field? With apathetic lifelessness Prüfer repeats here almost word-for-word, what his interrogator chews up for him. Already during the first interrogation Prüfer therefore had to consent to the keynote of the prosecution, that the crematoriums were built for the destruction of innocent people, i. e. mass murder – as if the hundreds and more daily accruing corpses because of the spotted fever epidemic in the spring of 1943 did not exist. »Question: Did Willi Wimoli talk to you that live people were burned in the ovens of the crematorium? Willi Wimoli (name transcribed from Russian) could have been an employee of the Topf Company, who incriminated Prüfer with his statements. In fact it would have been difficult to put a living human, who would defend himself violently, into a 70 x 70 cm (2 ft x 2 ft) large muffle, and the idea to use this method for mass murder can only originate from a sick mind. The interrogators accepted Prüfer’s answer, and subsequently there was no more talk about the cremation of a living body. »Question: What motivated you, after you discovered, that the cremation ovens which you designed were intended for the destruction of people, to stay with the Topf Company and to continue working as a design engineer for the construction of these crematoriums? Answer: I had a contract with the Topf Company and understood that my work was very important for the national-socialistic state, and that I would have been destroyed by the Gestapo if I would have quit the job. I was afraid of this and continued to work as a designer and head of the department for crematoriums. Because Prüfer could not contest the crimes he was accused of under the prevailing circumstances, he had to assert that he had to follow military order and fear of reprisals as mitigating circumstances. Countless accused used the same tactic during the NS-trials after him. Four days afterwards, on March 19, Prüfer was again interrogated by Captain Morskoi. He stated, that the Topf Company did not build gas chambers, but only installed the ventilation equipment for these (i.e. for the mortuary basement). He himself visited the camps in Buchenwald, Auschwitz and Groß-Rosen; he was six times in Auschwitz for the installation and erection of the ovens in the crematoriums, but also for the installation of the heaters in the disinfestation chamber (»v desinfekzionnoi kamere«). »Question: Were the crematoriums tested during your presence in the concentration camps Auschwitz? Answer: Of those six times when I visited the concentration camp Auschwitz only once in the beginning of 1943were two of the five ovens which were erected by me in the newly built crematorium in my presence tested. In all [ovens] were six corpses of men of varying ages being cremated, and there were also corpses of women and children lying in the crematorium, who were murdered in gas chambers und were to be burned in the crematorium. The total number of corpses was about sixty. Question: How did you participate with the burning of corpses of murdered innocent people? Answer: I checked, whether the ovens installed by myself in the crematorium functioned properly. Question: What was your conclusion? Answer: I concluded that in the crematorium the ovens which were installed by me, functioned well and without breakdowns. Question: Who of the engineers and technicians of the firm Topf participated in the installation of the crematoriums besides you? In the following Prüfer repeated, that he heard of the murder of innocent people in the spring of 1943, when he was in Auschwitz for the purpose of inspecting the ovens; subsequently he talked to Ludwig Topf as well as to Fritz Sander about his experiences. »Question: What did you report to Sander about your trip to Auschwitz? Many „eye witnesses“ alleged that in the crematoriums of Auschwitz always two or even three corpses were cremated at the same time in one muffle. We remember, that Fritz Sander during his interrogation of March 7 stated that Prüfer made a corresponding statement. Now Prüfer confirms this fact, but emphasizes at the same time, that the ovens could not stand the loading. In fact such a procedure would not have brought any advantage, because the simultaneous cremation of two or three corpses corresponding lasts two to three times as long and two to three times more fuel would be required than for a single corpse. »Question: If you knew, that in the crematoriums designed by you innocent people were destroyed, why did you nevertheless continue to work in this area? That Prüfer talked about »fascistic Germany« proves, that he – like Sander – adopted the jargon of his captors or had to adopt, with other words that he was mentally at least broken, if not even brainwashed. It is noteworthy, that the interrogators brought up only the innocent destroyed people in Auschwitz, but never asked Prüfer for their nationality or the reason for their killing. Neither during this interrogation nor the following questionings of Prüfer and Schultze was indicated not even with one word, that the murdered were Jews, who were exterminated within a racist motivated genocide. On March 19 1946 Kurt Prüfer was accused, and he pleaded guilty without reservation. We have already shown in Paragraph 4 above the corresponding statements. Eight days later, on March 27, was the next interrogation due, in which Prüfer gave information about his personal career as well as the history of the Topf Company. It was founded in 1878 and was led until 1945 by the brothers Ludwig and Ernst Topf. While Ludwig Topf committed suicide after the capitulation of Germany, his brother Ernst lived without being bothered in the American occupied zone. The firm Topf & Söhne produced besides crematoriums among others cranes, disinfestation chambers, incinerators for animal cadavers, machines to purify gasoline, as well as parts for airplanes, for disarming bombs as well as for the construction of disinfestation chambers. This was Prüfer’s last interrogation on German soil; the next one took place almost two years later, on February 11, 1948, after his transfer to the Soviet Union in Moscow. Here Prüfer was questioned by Smersch Lieutenant-Colonel Dopertschuk, where in many cases the same questions were asked as already two years earlier in Erfurt, but also a few new ones. »Question: Who of the Topf Company lead personally the negotiations with the SS-Organs about the construction of ovens for the concentration camps as well as the installation of gas chambers in the concentration camps? Answer: [...] First a certain Grosch, Chief of the SS-Bauleitung of the concentration camp Buchenwald, turned to us about this question. On instruction by the president of the company Ludwig Topf I conducted the negotiations with Grosch about the construction of two cremation ovens in Buchenwald. Soon after a representative of the Reichsführung SS, whose name I don’t remember, visited the Topf Company in Erfurt, who negotiated with Ludwig Topf about the construction of crematoriums for other concentration camps; for which ones exactly, he did not say at that time. On invitation of the head of the company, I as well as the head of the planning department Mersch [Transcription] participated. With the representatives of the Reichsführung SS it was contractually agreed at that time, that the Topf Company would take on the responsibility for the construction of cremation ovens in the concentration camps, but it was also agreed, that in each individual case a written agreement or contract has to be signed directly with the SS-Bauleitung of the involved concentration camp, i.e. with the client. This was afterwards done accordingly . Besides these two cases I also negotiated with the SS-Bauleitung of the concentration camp Auschwitz about the construction of cremation ovens as well as ventilation installations for the gas chambers. As a rule all written agreements or contracts about these projects were signed by the chief of the company Ludwig Topf. To this I would like to add, that during these negotiations the topic of gas chambers by the SS-Bauleitung of the concentration camps was not brought up. Question: Was it known to you personally for what purpose the firm constructed crematoriums and gas chambers in the concentration camps? This was actually exactly the reason for the erection of the crematoriums! Prüfer stated as he did two years earlier that he learned during a visit in Auschwitz in 1943, that »a mass destruction of inmates took place in this camp, among them also women, children and old men, who were sent by the Hitlerites[!] in complete transports from the countries of Europe which were occupied by Germany to Auschwitz«. Although this explanation differed from the one given two years earlier – at that time Prüfer did not report of a conversation about this with Ludwig Topf and a request to be relieved from the participation in the construction of crematoriums for the concentration camps - , it was accepted by the questioner without any comments. The reason that Prüfer slandered the dead president of the company is in his situation of course comprehensible, because from a dead cannot be expected a repudiation. »Question: Did the fact, that youw ere a member of the Nazi party since 1933, not influence your decision to some extent? During the next questioning – it was on February 13, 1948 and was conducted by Lieutenant Colonel Dejertschun – Prüfer had first to report in detail about the position and assignments of Gustav Braun within the firm. Braun directed as production chief the company factory in Erfurt. He was responsible for the hiring and discharging of workers and designed together with the production office the production plans of the company. He knew about all orders of the SS-Bauleitung in the concentration camps and participated directly with their implementation. But he was never personally in concentration camps. Two days later, on February 15, 1948 Lieutenant Colonel Dejertschun functioned again as interrogator. »Question: What pieces of equipment were manufactured in the factory of the Topf company for the construction of crematoriums and gas chambers in the concentration camps? Again Prüfer had to incriminate his former co-worker Gustav Braun, by emphasizing that he »was informed about all orders of the SS-Organs« and participated directly in their completion. During an interrogation on February 21, 1948 which was again conducted by Lieutenant Colonel Dejertschun, a diagram of the production organization of the Topf company, which displayed the relations between the individual departments of the company, was presented to Prüfer. He again listed the equipment pieces for crematoriums which were fabricated in the Erfurt factory. Four days later, on February 25 the accused Prüfer and Braun were confronted. The negotiation was conducted by Lieutenant Colonel Kusmischin as well as Lieutenant Colonel Dopertschuk. Prüfer again had to explain the official duties of Braun and had to repeat, that he »was always informed from which SS-Organ and for what work the company accepted orders.« Braun retorted, that he as production chief did know that the firm Topf & Söhne made cremation ovens, but where and for what purpose was unknown to him, because this question did not interest him. Prüfer then explained, that nearly all works for the building of cremation ovens in the concentration camps were done with Braun’s knowledge, and quoted in order to substantiate this allegation six points. This conduct of Prüfer certainly does not leave a favorable impression, but we have no right to judge him, because we do not know under what pressure he stood and how we would have behaved in his situation. The mutual playing out one against the other of accused is by the way a typical method of show trials and is especially used to make clear to those accused, whose will power has not yet been broken, after being confronted with the charges by former colleagues and friends, of the hopelessness of their “denial”. »Question for the accused Braun: The statements of the prisoner Kurt Prüfer, which were made here during a direct confrontation, have irreproachably proven, that the works of the firm Topf for the construction and provision of crematoriums in the concentration camps not only took place with your knowledge, but also under your direct participation. Please stop to deny obstinately, and make truthful declarations. While Braun had no questions for Prüfer, Prüfer asked his co-prisoner two questions. He wanted to know from him, whether he remembered certain events within the company, during which Braun met with representative of the SS-Bauleitung in Auschwitz. Braun declared that he does not remember these events. Of considerable greater importance was Prüfer’s interrogation on March 4, 1948, which we will reproduce here with only minor deletions. The questioning was conducted by Lieutenant Colonel Dopertschuk as well as Lieutenant Colonel Novikov. »Question: Which works were done by the Topf company in Auschwitz, and which part of it was yours? The first crematorium in the camp Auschwitz was erected in the second half of 1940 in the camp department Auschwitz. A semi underground building of reinforced concrete which was built by the Poles as a artillery depot or air raid shelter, with an area of 80 m², was used as the crematorium. Originally the firm Topf & Söhne built one two-muffle oven, and then – in the beginning of 1941 – the SS-Bauleitung of Auschwitz inquired at the firm about an increase in capacity of this crematorium, where upon my suggestion another two-muffle oven was mounted. Additional was on my personal suggestion for these two oven a suction blower installed, which increased the draft in the furnaces and accelerated the cremation, which further increased the capacity of the cremation ovens. The drawing and technical plans for the suction blowers were prepared by chief engineer Schultze, and the installation work was on the direction of Schultze handled by a mechanic of the firm, who especially for this purpose traveled to the Auschwitz camp. I personally prepared technical plans and drawings for the mentioned cremation ovens and also reviewed the work at the site. In the spring or Summer 1942 the SS-construction management of the camp Auschwitz accelerated the works of four new large crematoriums in the camp sector Birkenau, which were assigned the numbers 2, 3, 4 and 5. Number 1 was the old crematorium, located in the camp sector Auschwitz. The crematoriums in Birkenau were completed and placed into service between February and March 1943. They were equipped in accordance with the latest stand of technology and proved to be literally death factories, in accordance with their intended purposes in the camp. This was especially true for the second and third crematorium, which were equipped in accordance with the requirements of the central construction management of the firm Topf. In the buildings of these crematoriums were gas chambers installed, which looked like shower rooms and bath rooms and in which the SS-men murdered inmates by the group; afterwards the corpses were transported with electrical elevators to the cremation ovens and were cremated. Furthermore special rooms were furnished there for the service personnel consisting of inmates; also medical rooms for the autopsy of corpses, as well as morgues, where the corpses of the inmates which were tortured to death were stacked, because although the crematoriums were in operation 24 hours a day, they were not capable to burn all[the corpses]. In the second as well the third crematorium of Birkenau the firm Topf erected in each five three-muffle ovens (a muffle is an opening for the introduction of corpses into the oven); furthermore electrical lifts for the transport of the corpses. The Topf company built for the fourth and fifth crematorium only the cremation ovens, four two-muffle ovens in each crematorium. In these crematoriums were also gas chambers, but the Topf company was not involved with the machinery, and as far as I know there was no provision for ventilation. At the end of 1943 the Topf company built about 100 m from the area where the gas chambers were located, a large disinfestation plant, where the disinfestation of clothing as well as laundry of the inmates arriving in the camp was carried out. Also special ovens for the incineration of garbage were erected in crematoriums 2 and 3 by the firm. All this work, with the exception of the mounting of the ventilation systems, were carried out in the camp by mechanics of the company under my direct supervision and review. As a specialist for cremation equipment as well as representative of the company president I verified the correctness of the drawings of the crematoriums, which were submitted to the firm by the SS-Bauleitung for review and technical consultation; I prepared drawings and technical plans of the cremation furnaces erected in these crematoriums, I also traveled from time to time to the Auschwitz concentration camp and conducted there with the management of the construction department negotiations about all questions which concerned the building of cremation ovens as well as the provision of the crematorium, among those also about the equipment of the gas chambers with ventilation installations. This impressively long and quite detailed statement should be compared with the scant information which Prüfer furnished two years earlier about the extermination procedure! The reason for his sudden talkativeness is only too clear. Between March 1946 and March 1948 the picture of Auschwitz as a “death factory” which was in the beginning fuzzy had in the meantime be given a clear outline. In Poland the trials against the first Auschwitz commandant Rudolf Höß as well as against the guard detail of the camp were carried out and numerous former Auschwitz inmates had described the alleged human gassings. Let us recollect Prüfer’s statements during the interrogations in Germany: On March 1946 he spoke of a gas chamber which was “connected” to a wooden barrack as well as to the crematorium (he did not say which one). He did not elaborate further information during all interrogations nor during the following, and he was also not further questioned about this by the Smersch-officers, evidently because the latter had only extremely vague perceptions of the “extermination process” in Auschwitz. However in March 1948 Kurt Prüfer gave declarations, which were in agreement with today’s accepted Auschwitz-version: The four crematoriums which were placed into operation in Birkenau at the beginning of 1943 »proved to be literally death factories in accordance with their intended purpose in the camp«, especially Krema II and Krema III. In these the corpses of the gassed were moved with elevators to the oven room. The ovens there were »operated 24 hours a day«. As a specialist for crematoriums Prüfer of course knew that a cremation oven of the type that was erected in Auschwitz had to be cleaned regularly and had to be cooled down for this purpose, so that a continuous operation was impossible. He therefore would never have uttered such nonsense on his own free will. There is no doubt whatsoever, that Prüfer was before this interrogation thoroughly informed with the latest “discoveries” about the Auschwitz camp and that he had to duly internalize these. Question: You said before that the firm Topf built in crematorium I in the camp section Auschwitz two two-muffle cremation ovens, while in an official report by the SS- Bauleitung of Auschwitz of June 28, 1943, a photo copy of which lies in front of you, is stated that in that crematorium three two-muffle ovens were installed. Give an explanation for this! Answer: Now I remember, that in crematorium I, which is located in the camp section Auschwitz, the Topf company erected under my participation three and not two cremation ovens, i.e. it is so as explained in the report of the construction management which is in front of me. In this connection I would like to make clear, that the Topf company built in five crematoriums a total of not 20 but 21 cremation ovens. The report of the SS-central construction management of June 28, 1943, which was submitted to Prüfer, is about a listing of the capacity of the crematoriums, which according to this document could cremate 4,756 corpses per day. The actual theoretical maximum capacity was about four times lower. While Engineer M. Gerner thought that this document is a forgery, Carlo Mattogno furnished a different interpretation. Incomprehensibly the Smersch-officers did not ask any questions to the stated capacity of the crematorium in that report, which was in complete contradiction to Prüfer’s testimony on March 5, 1946, according to which only 15 corpses could be cremated in five ovens with 15 muffles within one hour, but was content with a question about the number of ovens in Krema I. It is unlikely that Prüfer gave the wrong number on purpose; it is more probable that he did not remember the number six years after the installation of the ovens. »Question: Was in crematorium I in the camp section Auschwitz a gas chamber? Two years earlier there was never anything mentioned about a gas chamber in crematorium I. »Question: Who built this gas chamber? Answer: I don’t know this exactly, but I assume, that the gas chamber in the first crematorium in Auschwitz was installed by the construction management of the concentration camp Auschwitz themselves. Question: When and how did you find out, that there was a gas chamber in the first crematorium in Auschwitz? Answer: I heard about this accidentally in the year 1942 under the following circumstances: I traveled to Auschwitz on request of the SS-construction management of the camp Auschwitz in the Spring of 1942, in order to review the project of a planned construction of a new crematorium in the camp section Auschwitz, to submit my conclusions and also to inspect the site, where the erection of this crematorium was planned. I inspected the site in the company of an SS-man. When we passed by the first crematorium, I noticed through the half-open door in one room of the crematorium building human corpses lying on the floor in different positions. There were more than ten. When I approached this room, someone closed quickly the door from the inside. Because I did not know the purpose of this room in the crematorium I, I asked the SS-man who accompanied me about it. The latter told me, that a gas chamber was erected in this room, and in it inmates were poisoned with gas. On my following question, how this gas chamber functions, answered the SS-man evasive, he did not know exactly, but he did tell me that he knew that in the town of Lodz are gas chambers, in which SS-men killed inmates with exhaust gases from automobile engines; but later they improved the speed of the killing process and began to use some kind of gas. As the SS-man explained the killing process duration could be reduced to one to two minutes as a result of the use of gases. – The SS-man who accompanied him strangely knew »not exactly«, how the gas chamber in crematorium I in Auschwitz worked, but the operation of the gas chamber in Lodz, which is 200 km away from Auschwitz he could describe very well! – In Lodz inmates were first killed in gas chambers with exhaust fumes from automobiles. Today’s “Holocaust”-history does not know a thing of such gas chambers in the town of Lodz, except of gas wagons in the camp Chelmno (Kulmhof) northwest of Lodz. This example shows concisely how the “Holocaust”-history changed during the years after the war and only slowly gained its present form. – In order to accelerate the killing process they converted in Lodz from exhaust fumes to »some kind of gas«, where »open bottles with gas« were thrown in through special openings; now the death did not occur only after 15 minutes, but after one to two minutes. Prüfer concluded from this description, that the murders in crematorium I were committed in the same way. Although Prüfer does not talk about the disinfestant Zyklon B, which was used for the alleged mass murders in the crematoriums of Auschwitz I and Birkenau, the method described by him – respectively the »SS-man who accompanies him« - reminds remotely of the procedure as described in the “Holocaust”-literature: as is generally known Zyklon B was allegedly introduced through openings in the ceiling of the gas chamber, but not thrown in with bottles, but poured out of tins. The stated time of one to two minutes for the killing with Zyklon B would not have been possible, because the poison discharged from the granulates only slowly. It appears that those people who instructed Prüfer during the preparation for this interrogation were only insufficiently aware of the Auschwitz-version which was in the meantime accepted; otherwise they would have let him talk of Zyklon B-granules in tins rather than »open bottles«. »Question: Therefore you were informed about the existence of gas chambers [Plural] in the crematoriums [Plural] of the camp Auschwitz since spring 1942? Answer: Quite right. As I already earlier explained, I was aware for the first time in the spring of 1942, that in the crematorium I in the concentration camp Auschwitz was a gas chamber [singular] and that inmates were murdered brutally there by the SS-men. Question: Why then did you declare during the earlier interrogations, that you heard for the first time of the real purpose of the cremations and gas chambers in the concentration camps Auschwitz in 1943? Answer: In my testimonies during the earlier interrogations I simply erred with the date. In reality I learned about this, as I said, in the spring of 1942«. This “correction” followed logically from the development of the official Auschwitz-version between March 1946 and March 1948. It was necessary, because the alleged murders in the “gas chamber” of the main camp – of which Prüfer knew nothing during his earlier interrogations – took place in 1942 and not in 1943. Prüfer then repeated, that he knew about the mass extermination of inmates in Auschwitz since »beginning of 1942« and still participated in the construction and installation of new crematoriums until 1944. »Question: A photo copy of a letter with your signature of March 2, 1943 is in front of you, which is addressed to the SS-Bauleitung of Auschwitz and which is about ten gas testers. Explain for what purpose you were looking for these gas testers ordered by the SS-organs! Answer: The gas testers, which are referred to in the photo copy of my letter of March 2, 1943, I looked for on the request of the chief of that Bauleitung von Bischoff [correct: Bischoff], in order to equip with them the gas chambers in the crematoriums. When von Bischoff contacted me with that request, he explained to me, that after the poisoning of the inmates in the gas chambers they had often cases, where even after the ventilation there were residues of hydro-cyanide, which lead to the poisoning of the service personnel working in these chambers. "Send immediately 10 gas testers as discussed. Submit quote later." We herewith inform you that already two weeks ago we asked five different companies about indicating instruments for hydro cyanide-residues as per your request. Three companies have sent a negative reply and replies are still pending from the other two. As soon as we receive word regarding this matter, we will contact you immediately so that you can contact the company that manufactures these instruments. »gas testers« are instruments for measurement of the CO- and CO2-content in combustion gases. In view of the fact that the muffles in the crematoriums II and III of Birkenau had a total of ten smoke gas exits it can be assumed that the gas tester were ordered for these. Devices for the verification of hydro-cyanide remnants are not called »gas testers« but »hydro-cyanide residual verification devices«. Their application was mandated in hydro-cyanide disinfestation chambers. Because hydro-cyanide was used for disinfestation in Auschwitz since 1941, it is most unlikely that such devices were neither available nor known where they could be procured: Additionally there was no reason to order these from the Topf company, which did not manufacture them; when there was a need for hydro-cyanide residual verification devices, the firm Degesch could be contacted, which supplied these, as well as the fumigant Zyklon-B. The SS-Bauleitung as well as especially the local camp doctor of Auschwitz, who was responsible for the procurement of Zyklon B and all necessary accessories, had to know about this and would certainly not have contacted the Topf company in case of need for hydro-cyanide residual verification devices. As is obvious from the Prüfer interrogation of March 4, 1948, W. Rademacher is wrong with his claim that the letter was discovered »only in 1993«. If it was a forgery, it must have been done immediately after the war. Samuel Crowell also occupied himself with this documentr, and Carlo Mattogno made additional view points in 1998. At the end of the interrogation on March 4, 1948, Prüfer testified that he did not participate in the installation work of the ventilation system of the gas chambers, but he did not deny to have participated with the furnishing of other objects for these chambers, especially gas testers. During the following questioning, it was now March 9, 1948, Prüfer was again interrogated by Lieutenant Colonel Dopertschuk. He talked about materials sent by the firm Topf to the concentration camps Elrich (a sub-camp of Buchenwald), Sachsenhausen, Lublin (Majdanek) and Stutthof, with which he personally had nothing to do, and mentioned that he drove in 1941/1942 twice to the concentration camp Groß-Rosen, where under his supervision two three-muffle ovens were built, and stated – without objection - , that in that camp, at least at the time of his stay there, were no gas chambers (for homicidal killings). After the interrogators placed drawings of the crematoriums II and III of Birkenau in front of him, he confirmed, that the works shown on these drawings were done by him as well as Schultze. Finally he stated that in the spring of 1943 he and Schultze drove to Auschwitz in order to find out why the suction blowers in the ovens of the crematorium II did not work. Schultze was not able to repair the suction blowers and they had to be removed. When afterwards the functioning of the cremation ovens were tested without suction blowers, the corpses of 25 inmates were in his as well as Schultzes presence cremated, which, as Schultze informed him, were poisoned in the gas chamber. He, Prüfer never witnessed a gassings. Question: Which camouflage-designation was used on the drawings and correspondence documents between the SS-Bauleitung of the concentration camp Auschwitz and your company? With these statement Prüfer contributed his part for the deepening of the myth of the “code language”, which allegedly was used by the SS in order to hide the mass murders. Question: During a meeting with the SS-Bauleitung of the camp Auschwitz on August 19, 1942 you discussed the erection of two three-muffle ovens in the “baths with Sonderbestimmung”. Explain which “baths with Sonderbestimmung” were meant! Answer: This meeting was about the erection of two three-muffle ovens in the gas chambers which were erected by the SS-men in Birkenau which were completely separate from the crematoriums in the camp sector. I don’t know were exactly these gas chambers were located, because I never was in the area where they were located and did not see them. »Gas chambers, which were erected by the SS-men in Birkenau, completely separate from the crematoriums built in the camp sector«, whose exact location Prüfer did not know and which he never saw, were probably the alleged “bunkers”, in which according to the legend mass gassings were carried out before the completion of the Birkenau crematoriums. According to today’s view the bunkers were actually 900 or 550 m (airline) away from the Birkenau crematoriums and not three kilometers. Prüfer also testified, that the Topf company received in the first half of 1942 an order for the erection of four eight-muffle cremation ovens for the White-Russian Mogilev, however these were then shipped not to Mogilev but to Auschwitz. Two of them were finally installed in the newly built crematoriums IV and V – after it was considered in the beginning to erect them in the »baths for Sonderbestimmung«; the third was sent to the railroad station in Cracow, the fourth stayed in storage of the Topf company until the end of the war. »Question: For what purpose and on whose order did you prepare a progress report about the construction of the crematoriums Auschwitz in January 1943? A copy of this report is submitted to you. Whether a visit by Himmler to the »death camp Auschwitz« (Prüfer again “adjusted” to the linguistic usage of his jailers) for April 1943 was actually planned is another question. But such a visit did not take place; Himmler was in Auschwitz undisputedly the last time in July 1942. I just re-read this thread, good work Sailor. You'll never see the likes of AIPAC employee, CNN's Wolf Blitzer, talk about this. Sailor wrote: The report of the SS-central construction management of June 28, 1943, which was submitted to Prüfer, is about a listing of the capacity of the crematoriums, which according to this document could cremate 4,756 corpses per day. The actual theoretical maximum capacity was about four times lower. While Engineer M. Gerner thought that this document is a forgery, Carlo Mattogno furnished a different interpretation. Manfred Gerner has mentioned the ridiculous mistake in the address field concerning the rank of SS-Brigadeführer Dr.-Ing. Hans Kammler in that "document". The forger either wasn't aware of that undispensable detail or he had no interest to make his fabrication a convincing one (e.g. if he were a former member of the Zentralbauleitung, who was forced to assist the forgers in manufacturing their fake "documents"). Moreover this "document" was intended to be made look like it was dictated by SS-Untersturmführer Janisch (that's why the abbreviation Ja shows up in the file number), but the forgers again weren't successful: They added a full stop after those two letters. What a pity that there is no single authentic letter in the Moscow archives with such a full stop, but 50 without it. There isn't one single real document from this period of time either, which was typed by a typist with the abbreviation Ne. for Janisch, but 49 were typed by L. and another one by Lm. And last, but not least, the forger made another grave mistake with the file-number of that fake "document": 31550/Ja./Ne. As mentioned before, he added a full-stop after Ja, but he omitted the year after the file number. It should have been: 31550/43/Ja/Ne. They do say, you have to take in consideration quite a lot of details, if you want to be a successful forger! Natürlich wollten wir dann wissen, wer schrieb für »Ja« als Schreibkraft. Ergebnis: 49 Schreiben »L.« und eines »Lm.« in unseren Beständen. Ferner fanden wir 3 Schreiben die für Bischoff und Jährling von »L.« gefertigt waren. Geklärt ist mit dieser Untersuchung, daß es in der fraglichen Zeit in der ZBL keine Person gab, die unter dem Zeichen Ne. schrieb. Alle Fassungen haben eine falsche Dienstgradbezeichnung des Briefempfängers. Es gab in der Waffen-SS nur den zusätzlichen Dienstgrad »und Generalmajor der Waffen-SS«, wie auf Anlage 1 ausgeführt. Wir haben, wie oben geschildert, auch diesen Fehler geprüft. Im eingegrenzten Bereich fanden wir 5 Schreiben mit richtiger Anschrift von »Ja« verfaßt, darunter 4 mit dem weiteren Zeichen »L.« und eines mit »Lm.« Die auf das gesamte Jahr 1943 erweiterte Untersuchung ergab sehr viele weitere richtig adressierte Briefe. Eines, wie das inkriminierte Exemplar, mit lediglich der Bezeichnung »Generalmajor«, fand sich nicht! Herewith I report completion of crematorium III. The building has been taken over by the Camp Commander of KL Auschwitz. »Zur Beurteilung der Tätigkeit der Baudienststellen und zur Überwachung der befohlenen Baufristen ist es unbedingt erforderlich, daß sämtliche nachgeordneten Dienststellen die Fertigstellung eines Bauwerkes oder Bauvorhabens umgehend melden. »Melde die Fertigstellung des Schornsteines-Krematorium BW 11 und Pumpenhauses b.d. Hauptwache BW 29. Aus diesem Grunde enthält die zuvor erwähnte und in Erfüllung dieses Kammler-Befehls erstellte »Aufstellung der bereits übergebenen Bauwerke an die Standortverwaltung« u.a. die Brieftagebuchnummern der Briefe, mit denen die Übergabeprotokolle der jeweiligen Bauwerke an die Kommandantur des K.L. Auschwitz weitergeleitet wurden, das Datum der Übergabe und die Brieftagebuchnummer der »Meldung an Amtsgruppenchef C«. Wenn also das Protokoll der Übergabeverhandlung von Krematorium III am 24. Juni 1943 geschrieben und am gleichen Tag an die Kommandantur weitergeleitet wurde, und wenn die Standortverwaltung das Krematorium III am 25. Juni offiziell übernommen hat, warum befindet sich dann im hier behandelten Schreiben vom 28. Juni kein Bezug auf diese Vorgänge? Dies sind Dinge, die nicht in diesem Dokument enthalten sind, dort aber enthalten sein müßten. Die Meldung der »Fertigstellung« eines Bauwerks war ein rein formeller Vorgang ohne Angabe irgendwelcher technischen Einzelheiten, weshalb das Scheiben vom 28. Juni 1943 mit seinen Ausführungen über die Leistung der Krematorien bürokratisch sinnlos sind - und das ist genau das, was in diesem Brief enthalten ist, dort aber gar nicht hingehört. Sailor wrote: Question: You said before that the firm Topf built in crematorium I in the camp section Auschwitz two two-muffle cremation ovens, while in an official report by the SS- Bauleitung of Auschwitz of June 28, 1943, a photo copy of which lies in front of you, is stated that in that crematorium three two-muffle ovens were installed. Give an explanation for this! That's quite an interesting point here (Prüfer "remembers" that there were three double-muffle ovens in the old Krema I instead of only two, as he had said before, when his SMERSH-torturers reminded him. "'At first they [the Germans] built a small crematorium in Auschwitz I with 4 muffles. Then two large crematoria, II and III, were built in Auschwitz II (Birkenau)' (Dr. Filip Friedman, To jest Oswiecim!, Warsaw 1945, p. 72 and Dr. Filip Friedman (Director of the Central Jewish Historical Commission in Poland), Oswiecim - The Story of a Murder Camp, The United Jewish Relief Appeal, London 1946, p. 54). - The alleged installation of a third double-muffle oven in Auschwitz I is not mentioned here. In the 'Broad-Report' as well ' 4 ovens' are mentioned, which can only refer to the 2 double-muffle ovens with their 4 muffles (Rawicz (ed. ), KL Auschwitz in den Augen der SS, PMO, 1973, p. 159). Not till the Soviet Pravda-article of 7 May 1945 a third oven is mentioned." That would correspond with the two vents on the roof. So, Prüfer himself said in the SMERSH interrogation, there were only two double-muffle ovens in the old Krema I and it wasn't until he was "reminded" by the SMERSH interrogators that he "remembered" that there were in fact three! There's been numerous references to Kurt Prufer recently and what he testified to. This thread is quite pertinent and damning to the 'holocaust' storyline; hence I've brought it forward.